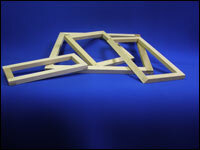 All of our frames are custom built to your needs and/or to your equipment specifications. Wood: A properly constructed frame with a sound joint is still an economical solution to basic screen printing applications. Miller Screen carries many frame sizes in stock. This type of frame can be an easy, same day solution to your screen needs. Aluminum: When the size of the screen or the nature of the printing application demands a stronger re-usable frame, aluminum is the next step up in quality. Custom cut at our facility and welded with a quick turn around, Miller Screen will meet customer needs and specs. 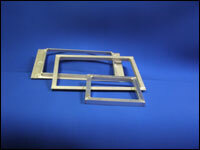 We use rectangular tubing, angle, bar stock or a combination of shapes. Aluminum offers the versatility needed in the screen print industry.